COUNTRYSIDE campaigners are calling for the Peak District National Park Authority to save two green lanes by closing them to traffic. Following the authority decision to review its strategy on managing 4x4 use on unsurfaced roads, Friends of the Peak District have written to demand immediate action at Long Causeway at Stanage Edge and The Roych near Hayfield. “We’re really pleased that the Peak District National Park Authority has taken notice of our Take Back the Tracks campaign and that it agreed that the strategy needs reviewing,” said Andy Tickle, Friends’ head of planning and campaigning. 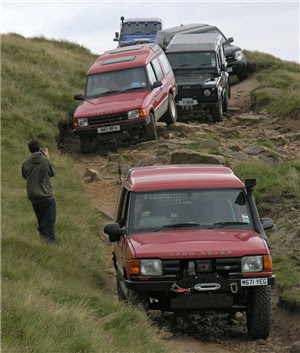 Take Back the Tracks campaigners held a rally at Long Causeway earlier ithis month to publicise the damage being caused by off-roading. They also spoke at the authority’s recent meeting. Repairs to Long Causeway have recently cost Derbyshire County Council nearly £30,000, “and that’s without sorting out the most damaged area. So closing roads is often a far more cost-effective solution,” added Andy. Great post! I've done this sort of driving experience too, loads of fun and quite scary at times but well worth the adrenaline rush! Like the person above, I've done this and though it was amazing. Thoroughly enjoyed it. Only problem was I didn't get as many pictures as I would have liked!